Marquis de Lafayette was born on September 6, 1757 in Chavaniac, France. His father was killed fighting the British during the Seven Year War. Then, when Marquis was just 13 years old he lost both his mother and grandmother. At this time Marquis received an enormous inheritance. He joined the French Royal Army the following year. Marquis soon grew to dislike the British, so when he started hearing the stories of America's struggles against the oppressive British, he boarded a boat and headed for America. Marquis was surprised by the lack of enthusiasm by Congress upon his arrival. He couldn't believe it when the colonist began to question his intentions. However, he was not the first “volunteer” to come from Europe. Many of the previous volunteers had come with extravagant claims, questionable military credentials, and big demands for money and rank. Then, Marquis surprised everyone when he told them that he would serve without pay and didn't care about his rank as long as he was near George Washington. As soon as George Washington and Marquis de Lafayette met they liked each other. Then not long afterward, Lafayette was made a major general. His first combat was the Battle of Brandywine in 1777. 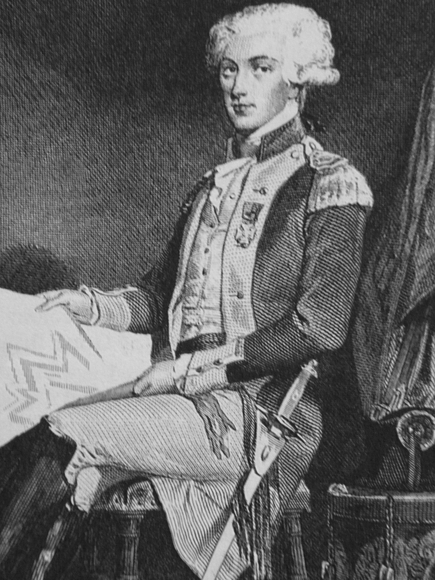 During a retreat, Lafayette was wounded in the leg. At the time, George Washington order the doctors to take care of him. As a result the two would become even closer friends. Soon, Washington put him in charge of an entire division. His men could not help but admire him. He was one of the wealthiest men in France, and if they suffered he suffered right along side of them. Then during one of the harshest winters that anyone could remember, Lafayette bought them warm clothing with his own money. He ate what they ate, even when the food was horrible. Before long, Lafayette would warn Washington about a conspiracy against him. The conspiracy was led by General Horatio Gates and Major General Thomas Conway. They attempted to seize the Continental Army from Washington in what historians call the Conway Cabal. Lafayette would spend a long winter with George Washington in 1778. Then in June, Washington gave Lafayette command of the 4,000 man advanced guard. Washington instructed him to strike the British when they looked vulnerable. A short time later, when the first fleet of ships to arrive from France proved worthless against the British ships, Washington sent the Marquis back to France to plead with the French to send them something more substantial. Lafayette returned with 5,000 soldiers and a fleet too small to attack the British in New York. He was next placed in charge of the Virginia Continental Army. Soon afterward he led his men in a battle against Lord Cornwallis and his British troops in the tobacco port of Yorktown, Virginia. Cornwallis was waiting for them. As Marquis and his men approached the city they had no idea that Cornwallis had hidden his men in the trees. In a short amount of time, Lafayette lost over 200 of his men. Upon his return to France, he negotiated several trade agreements with the American ambassador to France, Thomas Jefferson. Then after Charles X was overthrown in France, Lafayette had a chance to take over as a dictator. Instead, he let the throne pass to Louis Philippi and Marquis de Lafayette became the head of the National Guard.